A overnight pitstop in Wilmington, Delaware tonight after three days in the glorious sunshine of Florida. It could have been quite a boondoggle, apart for the fact that I had to make a presentation to 240 people on Tuesday, which soaked up quite a bit of nervous energy. It was a good trip though and the little walk I had yesterday has given my cheeks a tiny bit of a glow, although nowhere like some of my red-foreheaded colleagues who played a number of rounds of golf at $300 a pop! 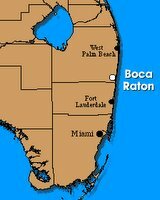 The sun and sea aside, I found Boca Raton quite a depressing place with row upon row of tired looking condominium buildings, in desperate need of an upgrade. The out of town conferencers mixed with old people holed up in this false economy of all year round sameness.